Free Shred and Information Event in aid of Data Protection Day a true success. It is advantageous for the General Public and Organisations within Ireland and across the Globe to be aware that January 28th is European Data Protection Day, and it is known as “Privacy Day” outside of the EU. The Global Scale of interest in the ever growing topic that is Data Protection is a true indication that Ireland and its population need to increase their awareness and knowledge of the topic in order to remain safe and secure from ongoing data breach threats. The key to providing people with information is to be proactive and physically help people and organisations to understand the true risks involved with data protection and not to simply wait for serious data breaches to occur in order for people to be aware and concerned. With this in mind there was a National Data Protection Conference held in Dublin Castle which was organised and held by both The Irish Computer Society (ICS) and the Association of Data Protection Officers (ADPO) which I am delighted to say was a great success. The event included leading industry speakers, real-world data protection case studies, and practical guidance for 2014. In the Southern Region of Ireland Security in Shredding analysed the Awareness and Knowledge of Data Protection and decided that they would like to organise a Data Protection Event for the General Public and Small to Medium Enterprises as it was time to give back to the Community through beneficial communications and physical activities. 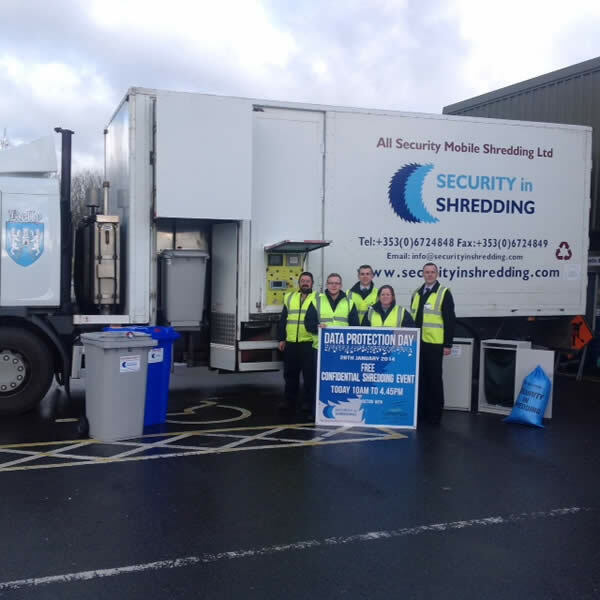 Security in Shredding is delighted to have teamed up with Limerick County Council Southern Region Waste Management Office in order to provide a FREE SHRED and INFORMATION EVENT for The General Public and Small to Medium Enterprises within the Southern Region. With the informative Conference being held in Dublin, the Free Shred and Information Event held in Limerick for the Southern Region received a hugely positive response and in turn we at Security in Shredding and Limerick County Council Southern Region Waste Management Office were pleased to team up and provide the public with a truly secure and free shredding resource for the day in addition to providing beneficial free information relating to Data Protection which in turn provided the attendees, their families and colleagues with the essential information to help keep their data safe and secure. On the day there were up to treble figures attending the Site of The Event in order to avail of the professional service and accurate information. The high attendance at the Event resulted in excess of 2,700 kg’s of confidential paper being destroyed beyond reconstruction on the spot with all Event Goers being capable of witnessing their sensitive documents being destructed to the highest standards available EU DIN 66399 Security Standard Shred. Not only did the Event provide the resource for the public to destruct their confidential information but it diverted in excess of 2,700 kg’s of material away from entering the conventional waste stream which in turn aids the environment and increases the security and confidentiality of the publics sensitive documents. The Event overall was a great success reaching out to thousands of people in the Southern Region in order to generate awareness in addition to saving our Environment from receiving in excess of 2,700 kg’s of sensitive paper. This year’s Event was in line with Security in Shredding’s Ten Year Anniversary with their 100% unblemished record within the Industry and we are delighted that the General Public and Small to Medium Enterprises provided us with such positive feedback. This year’s Event will not be the only event held by Security in Shredding and Limerick County Council Southern Region Waste Management Office as we hope to continue providing free, professional and knowledgeable Information to the Public going into the future that will benefit data protection awareness coupled with awareness of appropriate recycling practices. This entry was posted in Confidential Shredding, Data Destruction, Data Protection, Paper Shredding and tagged Confidential Shredding, Data Protection Day, Dublin Document Shredding, EN 15713, EU Data Protection by Security in Shredding. Bookmark the permalink.